Jonathon comes from a very musical family. His mother was a concert pianist and many of his uncles are excellent guitarists. His musical roots took soil courtesy of his mother in elementary school when she began to teach him piano. It was at this time he learned to read music and his superior aural skills began to develop. 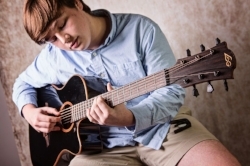 In middle school he began his formal study of guitar and progressed at a phenomenal rate. In addition to taking lessons he began to apply additional intensive self study and practice. From the vibration of the guitar to the endless theory he fell in love. Music is his way to express what's on his mind in a way that anyone can understand. Every time he picks up a guitar he feels the endless possibilities and through his love of teaching he hopes to show others the same. Jonathon is currently a senior at Monroe Area High School. Along with his success in music, he is extremely successful academically. He is currently ranked 5th in his class with a GPA of 4.125. He is very involved in his advanced placement classes and already earning college credit. His extracurricular activities include Anchor Club, Beta Club (treasurer), and National Honors Society. He plans to pursue a degree in Aeronuatics/Aerospace engineering at an Ivy League college such as Stanford or MIT. Jonathon strives to do his best in everything and hopes to instill the same attitude in his students.